I have a "go to" pizza dough recipe. Pat's Pizza Dough is a recipe that I have found in countless "other" places. I've got the same recipe on files dating way back in my recipe box and on my directory on my computer. I'm guessing that other people liked it too. It's a standard Yeast Raised bread dough recipe. I've made donuts, breads, bagels, and many other things from it. It's incredibly flexible. But there are times where you want to try something else. It also has 2 tablespoons of oil in it. Since I usually cook to a calorie count, those two tablespoons translate to 200 added calories. This recipe is a little lighter since there is no oil in it. That allowed me to toss in some sausage for the pizza which means that I could indulge myself a bit. You can make this recipe by hand, in a stand mixer, or on the dough cycle in the bread machine. I have done each of these and found it to work well no matter what. Add all ingredients except the flour to the mixing bowl and allow the Yeast to wake up by letting it sit for between 5 and 15 minutes. Add your flour to the mixing bowl and mix well until smooth. Kneed dough as you would any other and allow to rise until doubled. For pizza, roll dough out before the rest period to allow for the crust to rise for a thicker crust. Roll dough out to fit the pan and place on cookie sheet lined with parchment paper or foil that has been coated with a liberal layer of corn meal. Prepare pizza to taste with sauce, cheese, and toppings. Allow dough to rise in place until you are happy with the thickness of the crust. Place empty Pan in oven and preheat to 450F. When Oven is at temperature, Slide prepared pizza into pan. The way I did this was to remove the Now Hot! 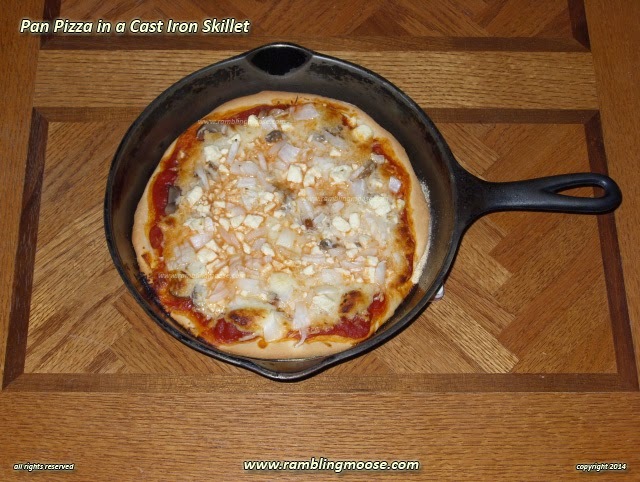 skillet from the oven and carefully drop that prepared pizza into the pan, then replace the lot in the hot oven. Yep, takes a lot of care and skill. Good luck! Caution, you will probably burn your hand so be careful! If you're worried, skip the pan and just go with a cookie sheet. See Plan B! Bake pizza for about 12 minutes before first check. Did I really have to tell you THAT? Starting over - grease the pan thoroughly, or skip the pan and just use a cookie sheet lined with parchment and dusted liberally with corn meal. Dust the pan with corn meal. Roll the dough in the pan until you get it to cover the bottom of the pan. Prepare the pizza to taste with sauce, cheese, and toppings. Place pan and pizza in the oven. I didn't have to say that again, did I?